King Harald Bluetooth was a viking and his ships were viking ships. A major part of the fleet rode at anchor or had moorage in Vejle Fjord (inlet) and one can almost imagine King Harald Bluetooth heading the housecarls as they ride along the old royal road from Jelling to Vejle to inspect the ships, workshops, depots and barracks situated there. We do not know exatly how King Haralds ship looked but it must have been both huge and beautiful, the longest and most beautiful viking ship in Denmark at that time. However, the Jelling shipbuilders of 1985 dared not build the longest copy of a viking ship but decided to build an amply ornamented viking ship instead. As it shows up today, the Jelling viking ship is only fifteen metres by three, but then its wonderful shape, its sparkling colours and decorations meet the eye of the spectator. Lying on the lake its two sea horse like sternfigures in blue and silver rise four metres above the surface of the water. The stern triangles with the snake and the bull from the runic stone emphasize the swing and the gunwale frieze (with subjects from the small Jelling jug) combine the two sterns. To young as well as old the ships golden larch tree planks, the individually decorated shields, the tholes and the 36 square metres striped sail make the incarnation of the old dream: the snake, the dragon, the giant and the King in one. 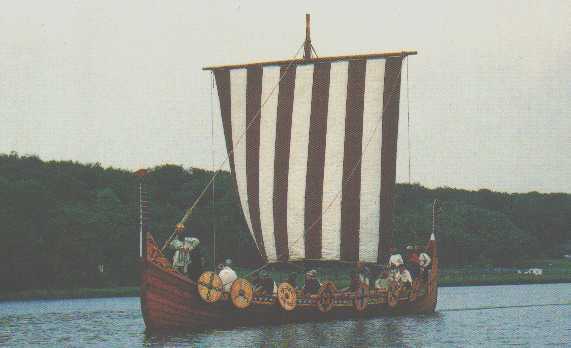 In Fårup Sø (lake) in which no viking ship has ever sailed, lies the Jelling Orm. It rides easy at the shore and can be watched and photographed when it isn´t on expedition in other waters. http://www.vikingorm.nl/index.html.. Henri Houben, Holland, Nederland.